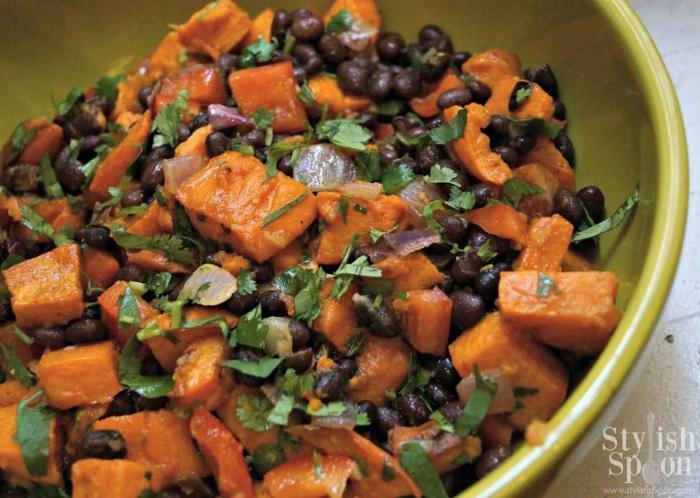 This healthy vegan potato salad is adapted from Mark Bittman's recipe for Roasted Sweet Potato Salad with Black Beans and Chili Dressing that appeared in the NY Times. 1Heat oven to 400 degrees. Put sweet potatoes and onions on a large baking sheet lined with tin foil and drizzle with 2 tablespoons oil. Toss to coat and spread out in a single layer. Sprinkle with salt and pepper. Roast, turning occasionally, until potatoes begin to brown on corners and are just tender inside, 30 to 40 minutes. Remove from oven; keep on pan until ready to mix with dressing. 2Mince garlic in mini food processor, then add jalapeño, lime juice, remaining olive oil and a sprinkle of salt and pepper. Process until blended. Toss warm vegetables in a large bowl with dressing and cilantro. Taste and adjust seasoning if necessary. Serve warm or at room temperature, or refrigerate for up to 2 days.